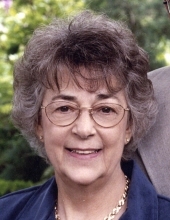 Betty Janet Wasleske, age 88, died peacefully on March 25, 2019 at Portage County Health Care Center in Stevens Point, WI. Betty was born on April 10,1930 to Betty W. (Christensen) and Alvan C. Seymour. She married Alfred Paul Wasleske on July 8, 1950. Betty met Alfred while working at the Wisconsin Telephone Company in Green Bay. After they married, they moved to Stevens Point where they raised their family. Betty was an active member of Peace UCC, the Telephone Pioneers of America and volunteered in the community. Betty enjoyed sewing, gardening, bird watching and collecting. Being a wife, mother and grandmother was her passion and priority. She is survived by her sons, Paul (Deanne), Bruce (Brenda), Carl (Sue), Eric (Leanne); daughter Lori (Leonard); grandchildren, Leah (Jason), Jon, Aaron (Laura), Ben (Kaylee), Ryan, Kaitlyn, Nash, Amy, Alex, Erik, Cade, David; and great grandchildren, Rachel and Piper. Betty is preceded in death by her loving husband, Alfred; parents; brother, Ernie; sister-in-law, Delores; son-in-law, Patrick Rajski; and infant daughter, Susan. A Memorial Service will be held on Saturday, March 30, 2019 at Peace United Church of Christ, 1756 Dixon Street, Stevens Point. Visitation begins at 10:00 am with the service to follow at 11:00 am. There will be a private interment at Forest Cemetery in Stevens Point. In lieu of flowers, the family prefers memorials be made to Peace United Church of Christ, Stevens Point. The family would like to give a special thanks to the staff at Portage County Health Care Center and Ascension Hospice for their compassion and care of Betty. To send flowers or a remembrance gift to the family of Betty J. Wasleske, please visit our Tribute Store. "Email Address" would like to share the life celebration of Betty J. Wasleske. Click on the "link" to go to share a favorite memory or leave a condolence message for the family.